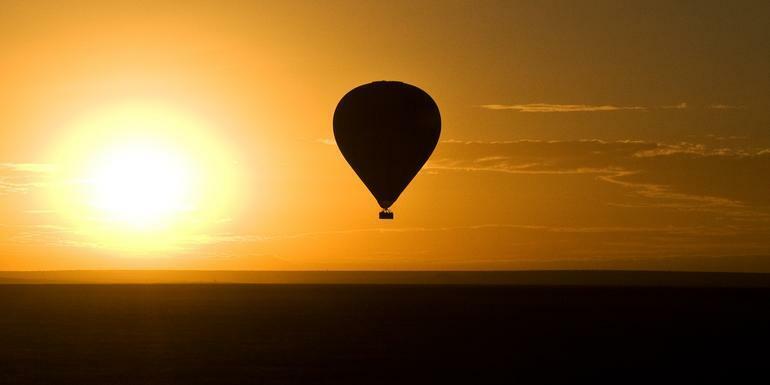 From dramatic savannahs to the Great Rift Valley, experience Kenya in all its glory. Travel the vast open plains and rolling hills of the Masai Mara and scour the wilderness for Africa’s "big five." Full-service camping under the big African sky will bring you closer to the region’s wildlife and gets you off the beaten path so you can really experience this land's unique culture. Our small safari vans minimize drive times and improve your chances of snapping that perfect shot of some of the most amazing animals on the planet. Only ground transport 7-seat 4x4 safari van. 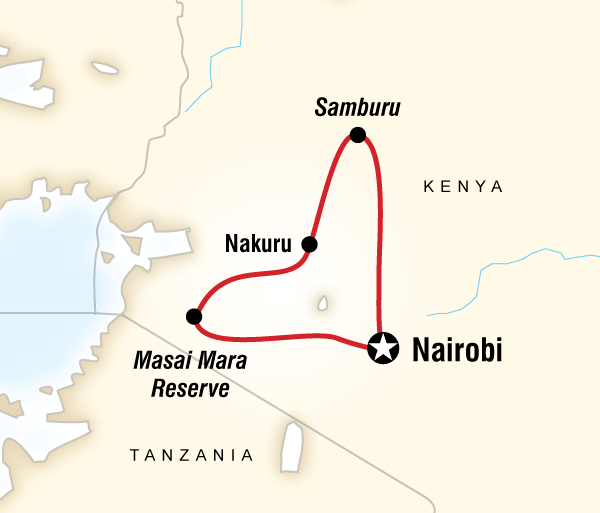 This trip is done in private 7-seat 4x4 safari vans. With sliding windows and a large pop-up roofs, these vans are designed for wildlife viewing. If there is a large group, 2 vehicles will be used, and the group will be split up. Road conditions can run the full range of conditions from new to very poor, and during dry seasons, the roads can become very dusty. This style of travel is by no means luxurious, but the seats are comfortable and having our own private vehicles allow us the flexibility of making stops when needed, and to stay and watch that crouching lion prepare for an attack. Speed governors set to 80kph are used on all vehicles to ensure a safe driving speed. Please note for your own safety it is mandatory to wear your seat belt at all times when in a vehicle. All G Adventure vehicles are regularly serviced and follow a strict maintenance schedule. However given the long travel days and rough conditions of many of the roads in Africa, vehicles can and do breakdown on occasion. If such situations occur all drivers are trained mechanics and any vehicle issues are rectified as quickly as possible so as to not disrupt your trip. Your patience is requested if the vehicle you are traveling in happens to encounter a mechanical fault. Camping in Kenya is truly an adventure. You will be able to get off the beaten track to get a first-hand experience of the beautiful wilderness and nature. While camping, we stay at designated campsites inside of and nearby the national reserves and parks. These campsites generally are very basic, and we carry tents to pitch at the public campsites. The campsite in Samburu are basic - being a public camp run by the local council. You will have no electricity, only gas lanterns in the evening, access to shared bathrooms with long drop toilets and cold showers. These first 4 nights camping will be in dome tents. At the Masai Mara, we will stay in a simple permanent tented camp. These are walk-in “safari tents” with single beds & mattresses. There is no electricity for lights or charging batteries. The facilities here are basic, though there are flushing toilets and hot water (when the boiler is working). The idea of camping in Africa can be a daunting one. For those not accustomed to ‘roughing it’ for a few days, don’t worry, your trip is a ‘full service camping’ experience. All tents are pitched for you, meals are prepared and served and the washing up is done by G Adventures staff. This leaves you with more time to enjoy your surroundings and is ideal for first-time campers who may be worried about the challenges such a trip can entail. Guides Chief Experience Officer (CEO) throughout, certified driver/guide, camp cook. 1. CAMPING SERVICE The idea of camping in Africa can be a daunting one. For those not accustomed to ‘roughing it’ for a few days we offer a full camping service. All tents are pitched for you, meals are prepared and served and the washing up is done by G Adventures staff. This leaves you with more time to enjoy your surroundings and is ideal for first-time campers who may be worried about the challenges such a trip can entail. When camping we are exposed to the elements, and whilst there are times when the weather is fine and temperatures are pleasant, there may be days when it is foggy, rainy and cool. In certain locations there may also be a number of bugs. These factors, however, should be seen as minor downsides to a camping experience which will allow you to get up close to the beautiful nature that Africa has to offer. All camping equipment (with the exception of your sleeping bag and pillow) is supplied. We supply canvas dome tents with built-in mesh insect nets on the doors and windows. Mattresses are also available, which are approximately 4cm thick, warm and comfortable. Please note drinking water, ice, and fire wood are not provided but can be bought locally with the assistance of the Chief Experience Officer. 2. SLEEPING BAGS Sleeping bags can not be rented on any of our Africa overland or safari trips 3. MIGRATION Tanzania and Kenya The Seronera Plains, which lie in the southeast of the National Park and extend into the western Ngorongoro Conservation Area, form the main ungulate calving grounds of the Serengeti. The wildebeest typically disperse into the Seronera plains during the short rains, which fall in late November or early December, before calving in January, and staying put until the end of the long rains from January to early May. Towards the end of April the wildebeest start to congregate on the southern plains in the preparation for the 800km northward migration. The major obstacle faced by the wildebeest on this migration is the crossing for the Grumeti River through the western corridor, which typically occurs from June into early July. From July to October, the ungulates disperse again, with about half of them crossing the Mara River into Kenya’s Masai Mara National Reserve and the remainder spreading out through the northern and western Serengeti. By late October the animals have generally started to plod back southward to the Seronera Plains, to arrive there in late November when the cycle starts all over again. 4. TRAVEL DAYS This is not a physically demanding journey; however, travelling can be difficult, as long drives and poor road conditions are the rule as opposed to the exception in both Kenya and Tanzania. A safari is about travelling to see animals, so we cover long distances south from Kenya and around northern Tanzania to visit different wildlife parks. Once there, we spend the majority of the time viewing wildlife while driving in the parks. This translates to a lot of driving. Despite this, the diversity and scenery of the African landscape, the local culture and abundant wildlife are all well worth the experience. 5. COMBO TRIP Please note that this tour is a combination of two G Adventures tours in two different countries. Due to local regulations, your local staff (driver/guide, cook) and vehicles will change halfway through the trip, and your group CEO and fellow passengers may also change between the Kenyan and Tanzanian sections of the trip. 6. YELLOW FEVER It may be required to show a Yellow Fever certificate upon entering the country visited. Please check in with your local health expert for advice on Yellow Fever and other inoculations required for this area. 7. LUGGAGE COMPLICATIONS It occasionally happens that luggage on international flights into Nairobi does not arrive, especially with, but not exclusive to, major airlines out of London-Heathrow or Schiphol (Amsterdam). Please be aware that this may happen, especially if you have a tight connection in either of these centres, are flying with different airlines with a connection, have a last minute flight change or re-route, or fly from or connect through another African centre. Please be prepared and keep all important documentation and valuables on your person. As well we recommend a change of clothes in your hand luggage. If unfortunately this does happen, and your luggage does not arrive, you should be entitled to a limited initial compensation from your airline. In Nairobi, the arrival of lost luggage normally takes between 48 and 72 hours after the initial plane’s arrival. The airlines technically should be responsible to forward your luggage to you, to your hotel or elsewhere in Kenya. You may find that your tour will begin, and you still have not received your luggage. Considering that the customer service standards in Kenya are different from home, and that we find that the airlines are not always pro-active in helping luggage in its care be reunited with its owner, it is recommended that you purchase locally a few needed items, begin your tour, and hire someone locally to persist with the your airline to retrieve your luggage. Your CEO or local representative will be able to help you organize this, and once your luggage is retrieved, it should be able to be forwarded to you – depending where you are. Please note that any costs that you may incur for luggage retrieval or sending luggage are not the responsibility of G Adventures, though we will always strive to assist you in any way possible. You should always keep all receipts and documentation, and contact your airline or insurance provider for reimbursement. 8. FLYING THROUGH LONDON-HEATHROW TO EAST AFRICA? Please note that regardless of the rules in other centres, travellers flying from, or connecting in, London-Heathrow are currently only permitted one carry-on piece of luggage and one small personal bag (purse, laptop-size bag, briefcase) on board on flights to Nairobi. If you arrive to the security gate with 2 pieces, you will be forced to check-in one of them, which may result in complications noted above. This policy is in place as of the time of writing, though local rules and regulations may indeed change. It is thus advisable to contact your airline directly for the most up-to-date information. 9. ELECTRICITY The power supply in Kenya and Tanzania is nominally 240VAC, 50hz. Variable voltage, spikes and sporadic, unexpected, unscheduled power cuts of varying duration can be expected.